www.ditl.org • View topic - Other Ships In The Colonial Fleet? Other Ships In The Colonial Fleet? Re: Other Ships In The Colonial Fleet? Could it be one battlestar per battle group? That could make sense. Apart from Adama, the only people we've seen commanding a full-sized Battlestar have been Admirals (Cain and Nagala). 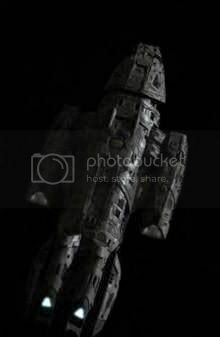 If their fleet follows modern conventions then it would make sense, as the Battlestars would be the flagship of the BSG. Sionnach Glic wrote: That could make sense. Apart from Adama, the only people we've seen commanding a full-sized Battlestar have been Admirals (Cain and Nagala). If their fleet follows modern conventions then it would make sense, as the Battlestars would be the flagship of the BSG. Actually, no it doesn't. The Admiral would command the fleet, while the Captain of the ship commands the actual ship (Commander in nBSG). That's how it is in modern Carrier Groups too. BsG is also an old ship about to retire too so maybe they didn't want to waste an Admiral on some old rust bucket. Cpl Kendall wrote: Actually, no it doesn't. The Admiral would command the fleet, while the Captain of the ship commands the actual ship (Commander in nBSG). And as was previously mentioned, there very well COULD have been a BSG group flag officer, but as Galactica was no longer serving with a BSG (I'm guessing like most of her original mark VII squadrens, the other ships were reassigned) what would an Admiral have to do? We didn't see any Admirals when Adama was on that solo mission with the Valkerye either. Wasn't the Valkryie of a smaller design? It's difficult to scale it to anything, but judging by the tiny size of the CIC (smaller even than a Mercury's) I'd bet it's quite a small ship. A light carrier of some sort. Or, modern tech let them minimize the crew and systems needed in CIC. Remember, Pegasus was stated to be "twice as powerful with half the crew". The quote was "Twice the size with half the crew", but that statement was extremely wrong. Pegasus is only a few hundred metres longer than Galactica. Personally I'd always assumed she was reffering to the fighter complement when she talked about size. Also, the Pegasus' CIC was a fair bit larger than the Valkyrie's. Sionnach Glic wrote: The quote was "Twice the size with half the crew", but that statement was extremely wrong. Pegasus is only a few hundred metres longer than Galactica. Personally I'd always assumed she was reffering to the fighter complement when she talked about size. I'm not sure about the bridge size though. It seemed more a matter of angles and perspective to me. Given that Galactica is 1400m long, Pegasus would only have to be 17-1800m long to be twice the volume (and, presumably, mass), assuming identical proportions. Given that the she's also a lot bulkier than the Bucket, I doubt she'd need to be that much longer. Pegasus also had double-stacked hangar bays, which might also have been what the statement was referring to. A barista is a bartender, right? Well, there was a bar on the Galactica called Joe's Bar, so I guess Joe would be the ship's bartender. Mark wrote: I'm not sure about the bridge size though. It seemed more a matter of angles and perspective to me. I think you may actually be right regarding the size of the CICs. I've found a brief shot from The Plan which may be useful for scaling purposes. I wouldn't have a clue about how to go about scaling something, but maybe someone here could try scaling the ship to the Vipers? 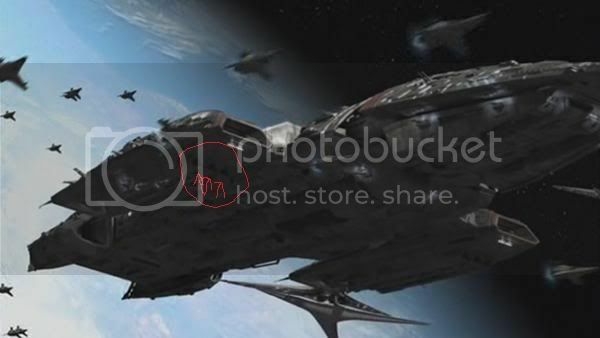 Ignoring the fighters, there is something in that scene which could give us an indication of the ship's size. Check out the flight pod. See those three triangular shadowy openings just below and aft of the landing deck entrance? Those look a lot like Viper launch tubes to me. You can see almost identical openings on the Galactica herself, which we know to be launch tubes. So if those are indeed launch tubes then we can get a rough estimate of the ship's size. A Viper which fits snugly into the launch tube has a wingspan of 4.7 metres. Let's be generous and assume then that the launch tube is 6 metres across at its base. Someone else here could probably do it more accurately, but I came out at less than a kilometre. Just going by the guns on the starboard side, she's significantly smaller. If we assume that they are PD guns and are of similar size to the Buckets, which you cannot even see on the ship in the show unless they zoom in.